I came home from work on Monday and there was a box stuffed in between the front door and the storm door. I wasn't expecting anything. When I looked at the return address, I discovered it was from Meredith. Oh yeah. She said she was sending a bunch of stuff. Now, we go through this every time she says she's going to make up a box for me. I love getting things just as anyone else does, but I don't want someone to use their hard-earned money on me in lieu of spending it on milk and bread for themselves. I have to admit that, secretly, I struggle with being the kind of person that people actually want to send things to. Have I really earned the right to be that kind of friend to you? I protest. I am, inside, thrilled beyond measure, but I struggle with myself and the acknowledgement that you care enough about me to do this for me. I never, ever want to be seen as "that person". You know the one, the one who just assumes you will always send them something. Although I knew this was coming, it was still a treat to find it stuck in the door. I completely forgotten that she said she'd posted it. I'm sorry to say the girls were not interested this time. It never got a cat scan. I wonder if they have just accepted that there will be boxes coming to this house and most of them aren't going to have cat treats, scratching pads or toys in them, nor are they going to be big enough to lie down in. Upon opening the box, this was layer #1. This is Meredith's special snack mix. Those are seasoned oyster crackers. I admit I have not tried them yet. I am saving them for this weekend's event with my guild in the game. I think they will go well with ice cold 7 Up or Ginger Ale. They smell really good. Layer #2 was only 2 things. That's a bag of M&M's with peanuts and pajamas. This is a tee shirt pajama. I love these. The one I currently wear is the last of a bunch. It's rather ratty and will probably be in the rag pile by the end of the year. 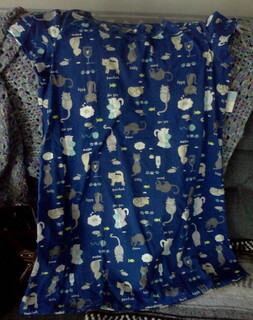 Royal blue is my favorite color and this has a cat design. It's perfect and it fits wonderfully. No, I am not posting a photo of me wearing it. There are some things this blog will never have on it and that's one. Layer #3 was more food goodies and the stickers shown in the first post of today, which is below. 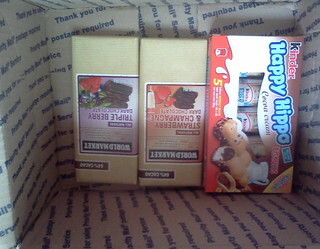 In the box Meredith sent in February, she had included the chocolate band-aids and a box of Rooibos tea. Both were a hit with me. I still haven't found, in my regular travels, another box of Rooibos but here now, I don't have to until maybe the end of fall, since I like to drink a variety of different teas. I ate the chocolate pandas last night. They were fun but they can't hold a candle to an item she included on layer #4. 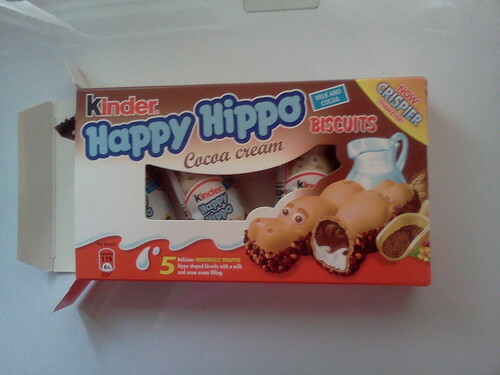 These are so incredibly good. Just take my word for it. I believe she gets these at World Market. Oh man. They were the first thing I ate. 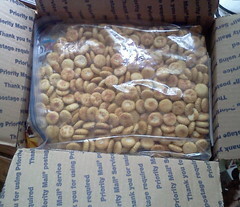 It says "crispier" on the box, but, when she sent the first batch back in February, I liked those just as much as I liked these. Silly and loaded with calories. Yes please. Here's the rest of layer #4. I took the chocolate bars to work and have relegated myself to two sections when I feel myself sagging. That's usually around the 2 p.m. hour. I started on the strawberry and Champagne bar. I want to stretch these out as long as I can. A pick-me-up in the middle of the afternoon is a good thing and chocolate is the perfect remedy. Yes, I did only eat two squares. 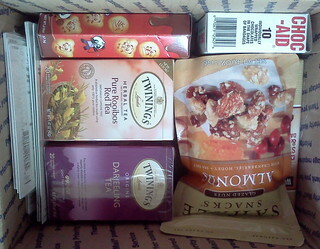 So, there you have a visual tour of the box of awesome from Meredith. I am thrilled, just thrilled with all these little bits and pieces. Plus, I am even more thrilled that she did this for me. Thank you so very, very much. I am really touched.